Holidays are always a wonderful time to take a simple learning activity and turn it into a fun, themed game. We made this game a few years ago and it still gets pulled out with our Valentines decorations each year and ignites new enthusiasm every time. Plus, as is my way, it's super simple to create and play (and cheap!). Grab a package of those big foam craft multi-coloured hearts you see at the dollar store around this time of year (make sure you have at least 26 of them). You'll need the hearts, a pair of scissors (if you have the kind that cuts in a zig zag, even better, but regular scissors will do), a permanent marker and you're good to go. Write the upper case and lower case version of a letter on each side of the heart, one for each letter. Then cut it down the middle. You can do it straight or in a puzzle shape or squiggles, whatever you like. 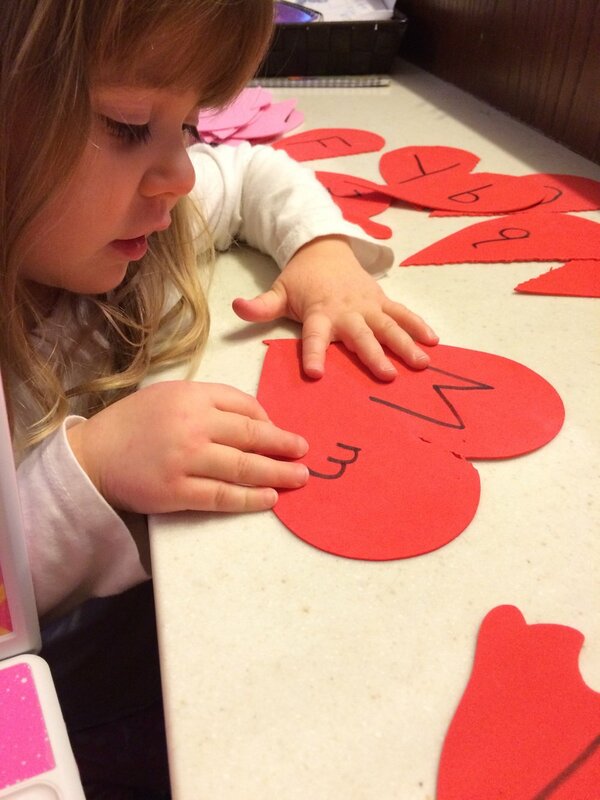 Hide the half-heart letters throughout the house, kind of like an egg hunt. There will be 52 of these babies though so don't make it too challenging or you'll be looking all day. Hand the kiddos a box or basket and send them off searching for the letters. Once they think they have them all, set them out on the floor or a table and have them start matching them up. This is where the multiple colours and zigzag or puzzle shapes come in handy. For younger kids learning upper and lower case it can make it easier to narrow down the options. Miss M sorted hers by colour first before trying to match the letter. If you realize you've come up short on some letters, send them out searching again for the missing pieces until you have the whole alphabet. And there you have it! A fun scavenger hunt and matching game that introduces little kids to upper and lower case letters. Bigger kids can get in on the fun too by timing themselves on how quickly they can match up all the letters!